To understand one of the reasons you should read Bicycle Quarterly, you need to know why I quit subscribing to the New Yorker. It wasn’t because I tired of the cartoons (I didn’t). It wasn’t because I didn’t read much of the fiction (though I didn’t). It wasn’t because I tired of long-form journalism (I love writers who believe their stories need space for a proper airing out). I quit because the New Yorker infuriated me with its lack of self respect. I’m talking about the subscription label glued to the cover–those sometimes clever, sometimes thought-provoking and sometimes beautiful covers. Imagine Edward Hopper bringing a big rubber stamp down on Nighthawks. COMPLETED BY ME, EDDIE “PENSIVE” HOPPER, JANUARY 21, 1942, YOU STINKERS. Why would he do that? He wouldn’t. He didn’t. Why does the New Yorker do it? One reason could be it’s the cheap thing to do. Another is that Condé Nast might sell a few copies of the same cover for $125 a pop if the magazine defaces the version it sends to you. Compare that to Bicycle Quarterly. The mailing label is attached to a plastic wrapper that protects the magazine from damage in handling. What’s the message here from Editor Jan Heine? Here’s that high-quality publication you were looking for, Mr. Joslin. I wanted to make sure it arrived in good condition. I put a lot of sweat into this month’s issue, but you won’t even notice so much as a water spot. Enjoy. Thanks, Mr Heine. I will. -You like performance bicycles with steel frames. -You like smart, opinionated writing. -You’re intrigued that I’ve covered only the first third of this special, 108-page issue. -Did I mention Bicycle Quarterly still takes steel frames seriously? Wait a minute. You read this far? Get over to bikequarterly.com right now and subscribe. 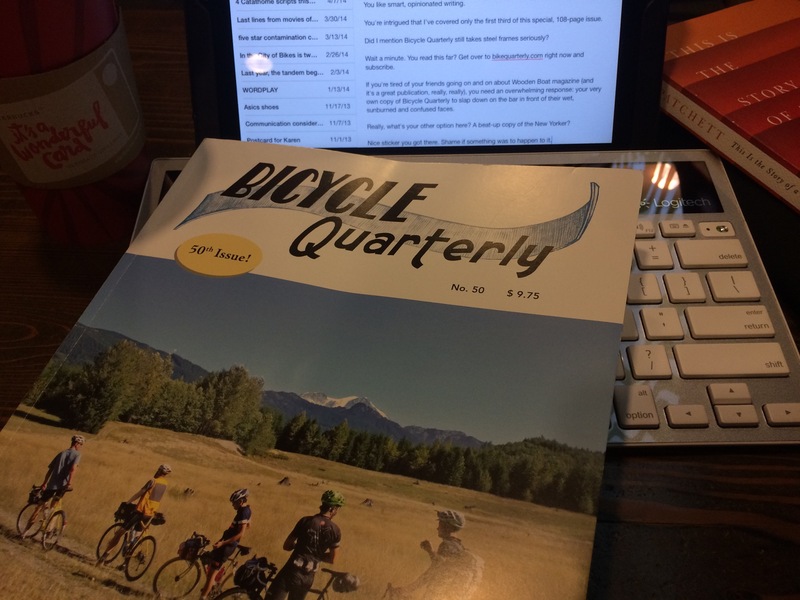 If you’re tired of your friends going on and on about Wooden Boat magazine (and it’s a great publication, really, really), you need an overwhelming response: your very own copy of Bicycle Quarterly to slap down on the bar in front of their wet, sunburned and confused faces. Really, what’s your other option here? A beat-up copy of the New Yorker? Nice sticker you got there. Shame if something was to happen to it. This entry was posted in Read and roll and tagged Bicycle Quarterly, J.P. Weigle, Jan Heine, magazine, Paris-Brest-Paris, randonneur. Bookmark the permalink. Nice post! Thanks – I’m in. You, of course, may appreciate Jan’s deep connection to France, though he’s doing some great work exploring the bicycle industry in Japan, as well. This month: inside Nitto. Definitely the best cycling magazine out there. I’ve not yet received my copy of the 50th issue in the post — will be approaching the mailbox with anticipation this week! Seems like one of your European trips would be a worthy addition to Bicycle Quarterly. I enjoyed your talk at the last Midwest Tandem Rally. You’ll have to update me on your Japan research someday. I was under the impression that it had been difficult (read illegal) to ride a tandem in the country. Don’t know if that was really the case, or if it was, whether it still is. As far as tandems in Japan go, I understand that the national law is one person per seat, but that about 1/2 of the prefectures officially say 1 person per bike, but that there is little to no enforcement. They also have required registration laws, but that’s also not likely to be enforced. When and if, we’ll wing it. At the worst, it will make for interesting stories! I look forward to the stories. Given the number of S&S couplers on your tandem, you could probably look at whoever questions it and say you assembled your two bicycles incorrectly and you’re still looking for the missing wheels. Yep! The best bicycling magazine out there. Sure, stories and reviews of new and sometimes revived (Mafac brakes) parts, but mostly it’s about the joy of cycling, of the history of riders and events of the last century. I even recently ordered a batch of back issues from before I knew of/subscribed to the magazine. Keep up the good work! Long may BQ thrive. It’s one of two publications I keep back issues of.